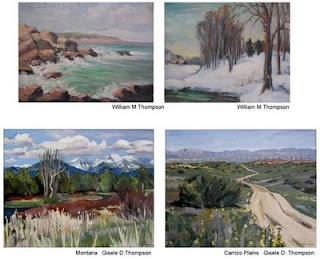 While on my retreat in Montana, I produced two paintings inspired by the the works of William M. Thompson, a landscape artist and illustrator from the 1940's & 1950's. His work in pastels and oils have a soft touch, which I haven't quite captured, his prints and originals are highly collectable. Well, and he just happens to be my grandfather in-law, so these are made special for my husband Bill. If you have a favorite landscape photo and are interested in commissioning me in this style, send me an email. Ok sista... those gave me chills! You have captured his spirit! Thank you for helping to keep his spirit alive.